Clarizol solution: Each ml solution contains Clotrimazole BP 10 mg.
Clotrimazole is a broad-spectrum antifungal agent that is used for the treatment of dermal infections caused by various species of pathogenic dermatophytes, yeasts, and Malassezia furfur. The primary action of clotrimazole is against dividing and growing organisms. Clotrimazole inhibits ergosterol synthesis, resulting in abnormal cellular permeability. This leads to fungal growth. Tinea pedis, tinea cruris and tinea corporis due to T. rubrum, T. mentagrophytes, E. floccosum and M. canis. Candidiasis due to Candida albicans including cutaneous candidiasis, onychia (infection of the nail or nail bed), paronychia (infection of the nail fold), external genital candidiasis, candida balanitis (Candida in the male genital area), nappy rash. Pityriasis versicolor due to Malassezia furfur. Apply sparingly to the affected areas and rub in gently, two or three times daily. Clotrimazole is generally well tolerated after local application but the few side effects have been reported infrequently like erythema, stinging, blistering, peeling, oedema, pruritus, urticaria and general irritation. If local intolerance develops, consider withdrawal of the medicine and institution of appropriate therapy. 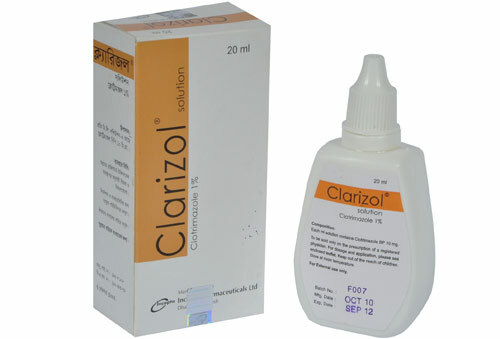 Clotrimazole solution is not intended for ophthalmic use. Pregnancy: Category B. Clotrimazole is recommended during pregnancy only after first consulting a doctor. Nursing Mothers: Because systemic absorption of clotrimazole following topical application is marginal, there should be no risk for the infant during lactation.